Stretch Tuesday again!? I’ve been enjoying the HOC postings over the last couple of weeks and I wanted to respond to Brian’s challenge about glass made by companies other than the big five – Fenton, Northwood, Diamond (Dugan when they started making carnival, but changed name by the time they started stretch), Imperial and Millersburg (which didn’t make stretch glass…didn’t last that long!). In stretch glass volume, we can easily take out Millersburg and put in U.S. Glass. That leaves Central, Jeanette, Lancaster and Vineland as “our” minor companies. 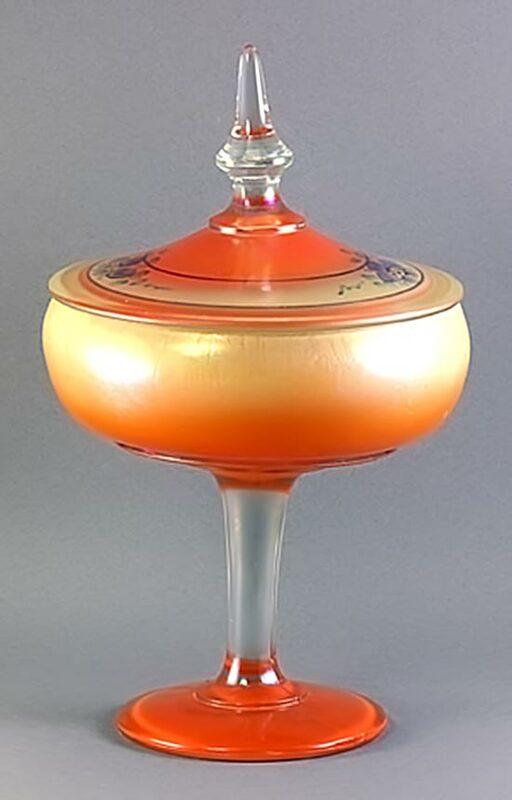 These companies also made iridized glass that would be considered to be carnival today, but they were generally simple patterns with marigold. Since I’m in the process of writing the technical article for our Stretch Glass Society Newsletter and I’m covering the Lancaster production, I’d like to give you a sample of their glass. Lancaster was located in Lancaster, Ohio and the factory eventually became part of the Anchor-Hocking Company. Lancaster had an interesting approach to their stretch line. 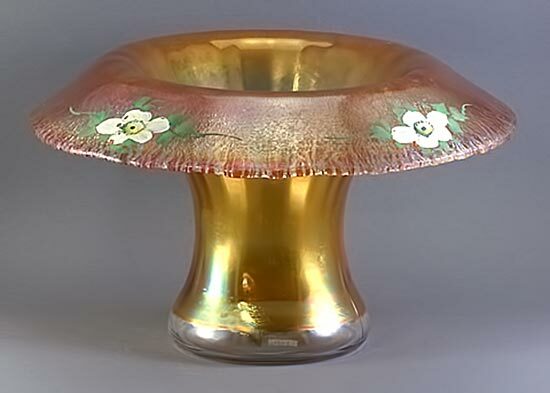 Basically they only had about a dozen molds that they used to make their stretch glass in only two iridescent finishes – crystal stretch (their Iris Ice) and marigold stretch (though they had a light version – Rose Ice, and a dark version – Aztec). 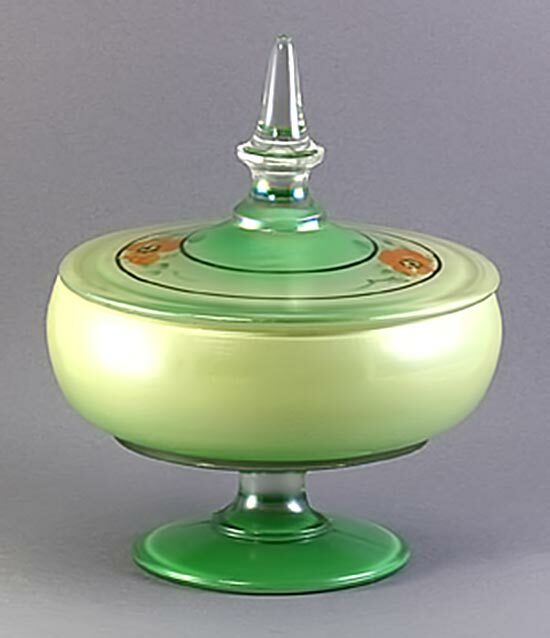 However, they would apply an overall enamel coating to the Iris Ice pieces which gave them three additional colors – Ruby Lustre (yellow to red-orange enamel), green lustre (dark yellow to green enamel) and white lustre (just white enamel). All of these lustre pieces have hand-painted floral motifs around each piece, usually blue or orange flowers with green leaves. Some of the Iris Ice pieces have the floral decoration without the enamel. They made five candy jars or covered bonbons. 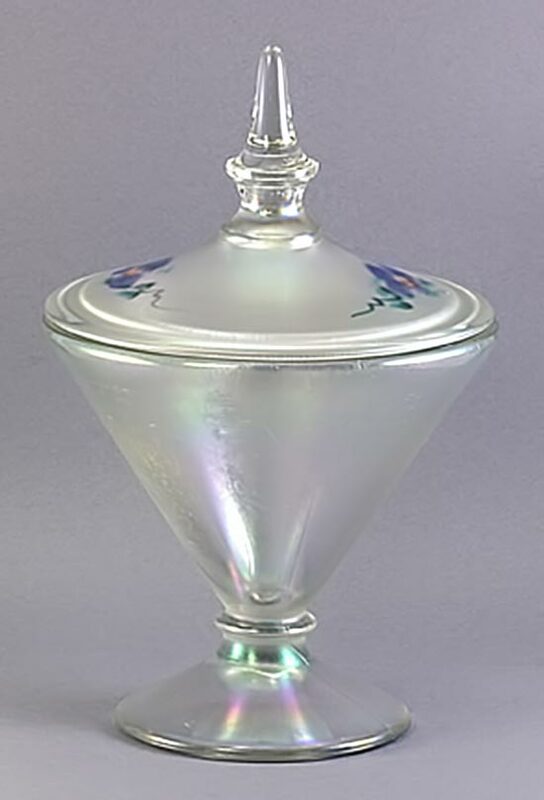 The cone-shaped one is often mistaken for Fenton (iridized), Central (enameled, but not iridized) and Dunbar (not iridized). I’m including one Iris Ice with blue flowers and one in Ruby Lustre. 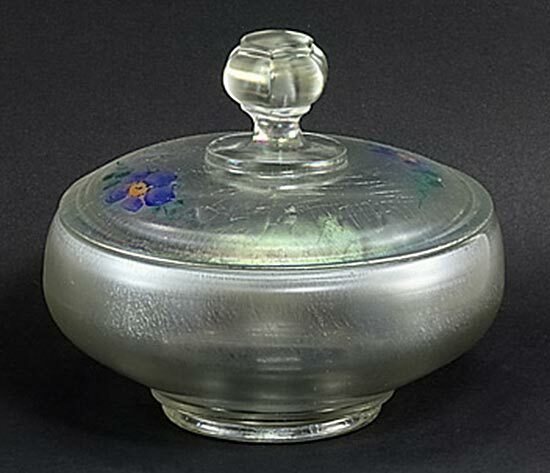 Their covered low bonbon is usually found in Iris Ice with or without the floral decoration and one lid type has a round knob and the other one has a hexagonal knob. 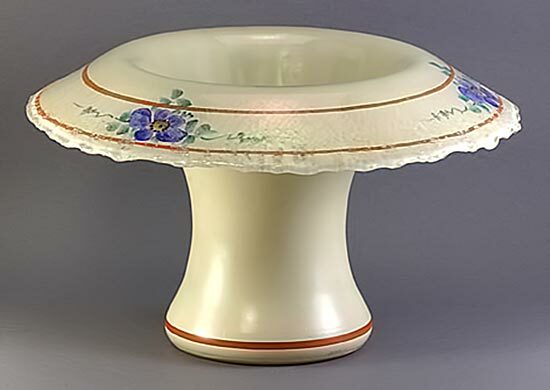 The also had a low-footed bonbon, a high-footed bonbon and a three-foot covered bonbon with optic interior panels. 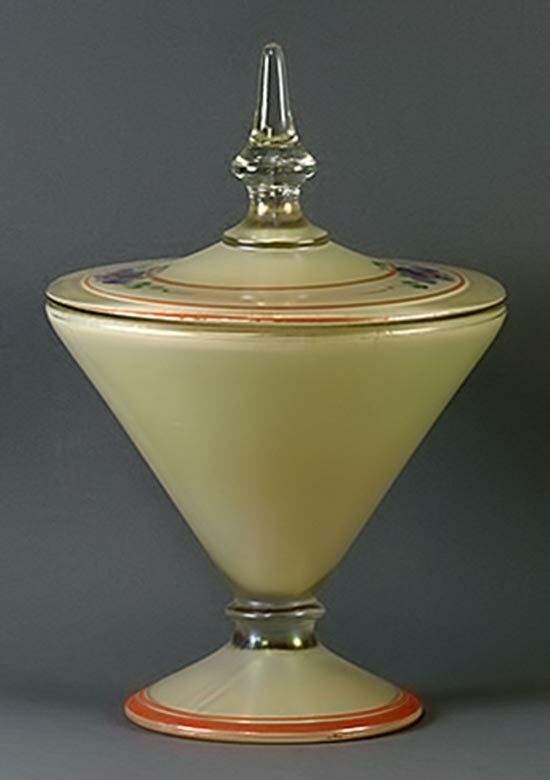 Their one blown-molded vase has optic ribs and usually has a rolled rim. They called this their pea vase. 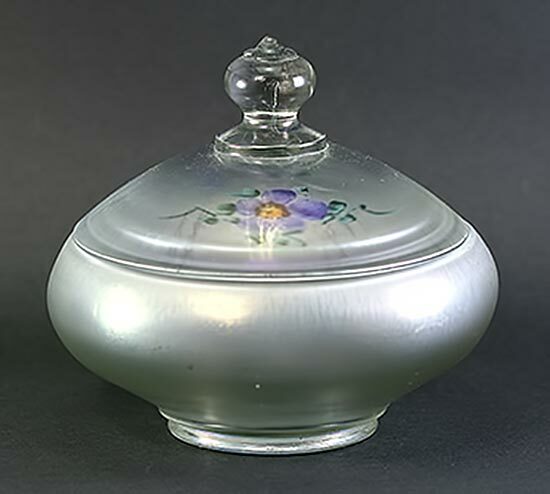 This is often mistaken for art glass because there was a circular vent in the bottom of the mold which usually leaves a circular impression in the bottom of the vase. These often have an excellent stretch effect. I’ll cover the rest of the common pieces in my next Stretch Tuesday and add in some of Lancaster’s “true” carnival pieces! 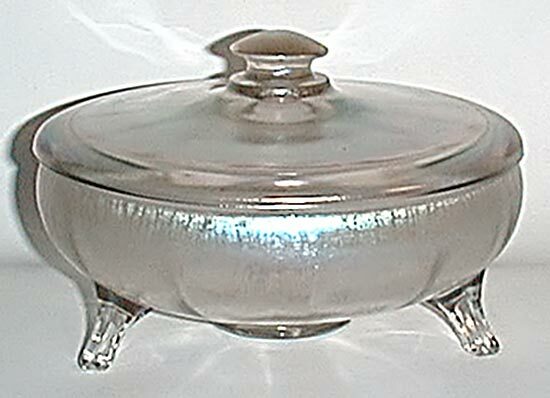 Have some great eats this week and don’t be afraid to use your iridized glass to add to the Thanks Giving festivities!